Yogi Adityanath, the Chief Minister of Uttar Pradesh, has banned paan chewing and gutka or tobacco in all government offices in the state. It reportedly took seconds for the 44-year-old priest-politician to announce the ban during an inspection of the old Chief Minister's office in Lucknow this morning. Later, a statement said that paan and tobacco products will also be banned in schools, colleges and hospitals. The Annexe building has long stopped being the office of the UP Chief Minister, who now sits at the new Lok Bhawan. Several top officials are still based there. 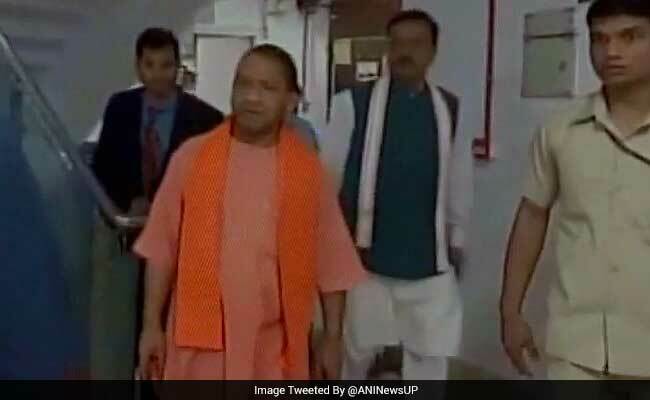 When Chief Minister Adityanath visited the building, he was reportedly furious at spotting rust-coloured stains of paan or betel leaf on a staircase - unfortunately a common sight in government buildings, not just in Uttar Pradesh. The staff got a piece of his mind. Deputy Chief Minister Keshav Prasad Maurya, who was with Yogi Adityanath, said the Chief Minister had "advised" against consuming paan masala and tobacco in government buildings and offices. "The Chief Minister inspected the Annexe and directed officials to maintain cleanliness of both the Annexe and the state so that change is visible," Mr Maurya said. The staff has also been asked to avoid using plastic, he said. On Monday, Chief Minister Adityanath had administered a cleanliness pledge to top officials from across the state and distributed copies of the BJP manifesto for mandatory reading and implementation. Swachch Bharat Mission in every corner of the country." Yogi Adityanath, who is the head priest of Gorakhnath Temple in Gorakhpur, is known for daily cleanliness checks.